Hongo is a character in Yoshi Topsy-Turvy. 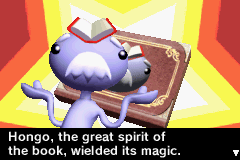 He is the great spirit in control of the Forbidden Pop-Up Book. He makes an appearance in Super Smash Bros. Ultimate as a spirit. When Bowser starts wreaking havoc on Yoshi's Island in Yoshi Topsy-Turvy, Hongo traps the entire island within the pages of his pop-up storybook. While Hongo's intention was solely to get rid of Bowser, he ended up trapping everyone and everything on Yoshi's Island within the pages of his book. As Hongo rejects the idea of freeing everyone, as that would set Bowser free as well, the Yoshis have to lock Bowser somewhere else so they can be freed without freeing Bowser. To aid Yoshi in his quest, Hongo provides the Universal Gravitation Device, which allows Yoshi to manipulate his environment. After Yoshi defeats Bowser, Hongo agrees to restore Yoshi's Island back to its normal form. Hongo is quick-tempered, very powerful, pious, and likes to be in control of other Spirits. He shows that he can be very pious, as he wanted to help Yoshi and didn't bring Yoshi Island back to normal because Bowser would attack the island again. Also, he allows the Spirit Who Loves Surprises which was banished to go back into his council. While it appears as if Hongo is the Spirits' Leader, it is unknown if the Spirits have a higher leader than Hongo. 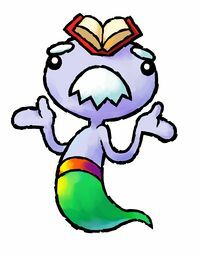 Hongo has a purple torso and head, and a white, comb mustache with thick, white eyebrows over beady black eyes. He wears green pants, which are held up by a red belt. A red book lies on top of his head. Gohhon Onomatopoeia for coughing, and a pun on hon (book). French Teuheu Onomatopoeia for coughing. This page was last edited on December 25, 2018, at 04:20.